Ryan Blaney and his No. 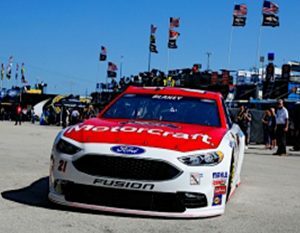 21 Motorcraft/Quick Lane Ford Fusion wound up in a familiar position after Friday’s Sprint Cup qualifying session at Homestead-Miami Speedway. After finishing 11th in the first round of knock-out qualifying and second in the second session, Blaney was eighth in Round Three. It was the third straight week that Blaney qualified eighth and the ninth time this season that he qualified eighth or better. He’s earned a top-12 starting position 12 times this season. Blaney said in his post-qualifying comments that he was hoping to close out the 2016 season with an even better qualifying effort, but slipped ever so slightly on his final lap. “[Turns] One and Two weren’t very good,” he said. “I tried to switch something up there, and it didn’t really work. Still, he’ll be starting ahead of the four drivers who will be racing for the Sprint Cup championship in the Ford EcoBoost 400, the premier event of Ford Championship Weekend. The Ford EcoBoost 400 is set to get the green flag just after 3 p.m. on Sunday with TV coverage on NBC.